The Level, the square in front of the Howest building Digital Arts and Entertainment (DAE), has been redeveloped into an environment for true interactive gaming – by moving instead of just ‘pushing buttons’. Electricity and internet are available and in front of the building a LED screen is placed. Furthermore the square is provided with plug and play systems, which makes it easy for game designers to test their prototypes. This public outdoor lab will be used to test and experiment innovative ways to make people move through new interactive controllers and new games. Students hang around The Level before, after or in between classes. 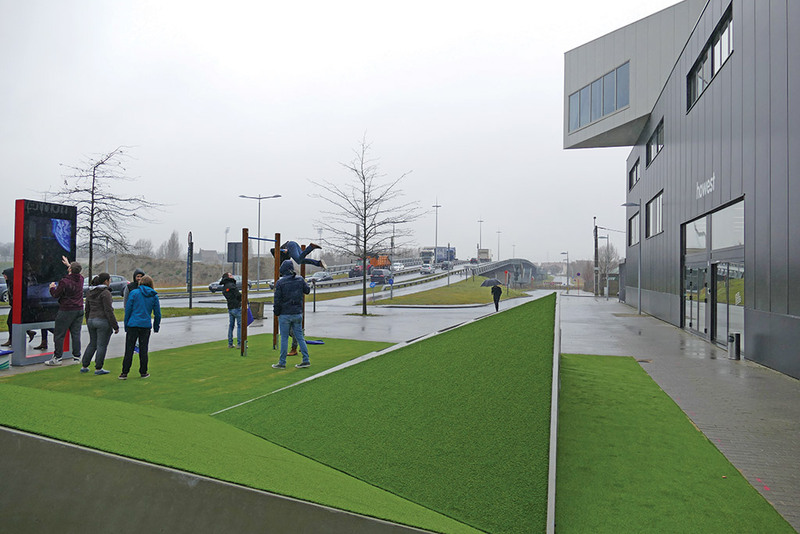 The new interactive concepts make a connection with the world of gaming and stimulate students to be physically active during moments of waiting. The first game for The Level has been developed by Bazookas game studios.